Rafi and Rabih are two Syrian students. Rabih has been working since he is very young helping his father in agricultural fields in the Bekaa and Rafi has been doing various jobs. They are now in a technical school in the mountain region of Shouf and they joined the DLI team. Working on the project has been challenging for them because of their job requirement. Rafi, for example, works in a poultry farm to get additional income for the family as his father fell ill. His job in the poultry farm exhausts him, keeping him up till the early morning hours, chasing the chickens in the farm, driving the poultry truck and assisting the accounting department. He gets such little sleep that it is hard to follow the next day in class. With all the pressure in his life, he says that the DLI project gave him skills and encouraged him to look into what is around him. Together with Rabih and the DLI team they are committed to the team’s project and their wish is to take the project to implementation in real life. The team, including the teacher, share that same energy and commitment because they all come from an agricultural background and believe that their project will improve their lives and the quality of the produce. Their idea is to automate a drip irrigation system and to regulate and automate the amount of fertilizers or pesticides to be given in the field. They learnt about the importance of giving the correct amount of pesticides and that often farmers use them in excess, which could become hazardous to our health because of the residue. 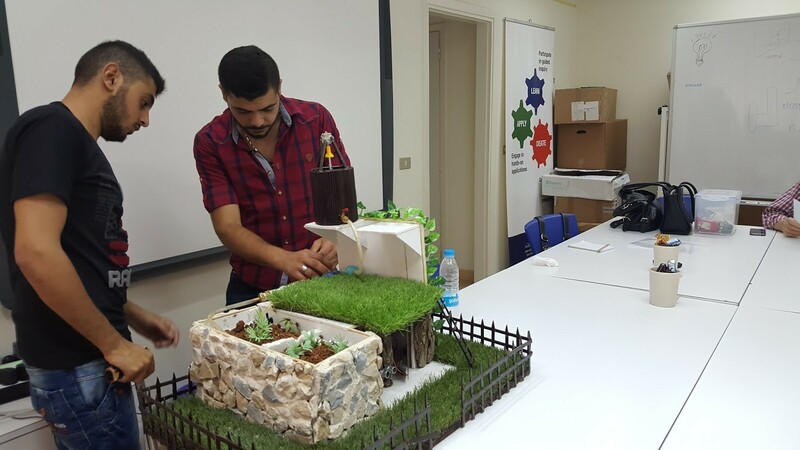 In the first phase, they designed a prototype and tested the automation using humidity sensors and a drip irrigation system. Secondly, they added an automation process to mix the correct amount of fertilizers depending on the plant type. The project would, of course, reduce water waste and speed up taking care of the fields but it would also increase the produce and reduce the residue. Rabih and Rafi were explaining that this project brings them much more scope for the future and that it meant everything to them to succeed and make it work in real life. Rafi has decided to leave his poultry job. Together, the students are exploring further how to improve the project in order to build a prototype to commercialize. It is a new way of thinking for them. Moreover, the teacher will fit the DLI project and Coder-Maker material in her IT lessons as she has seen a great benefit. She said “My students are so much more motivated and the material meets the objectives that I teach. So I am actually meeting my objective with much higher learning outcomes”. We were also impressed by the commitment of the principal of the school and his willingness to dedicate land belonging to the school to run the tests of this projects.